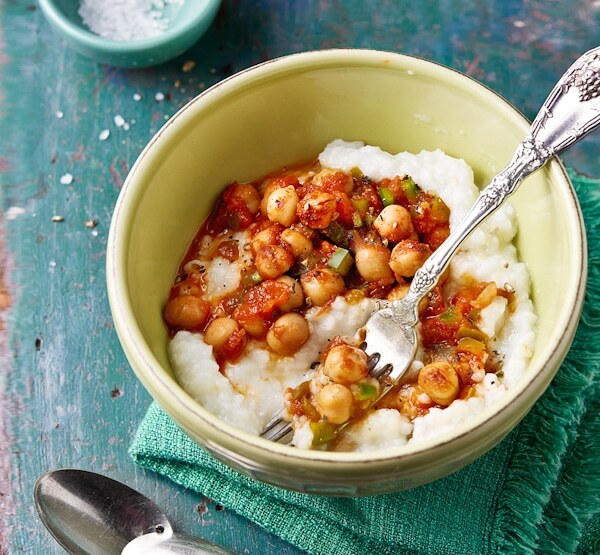 I love chickpeas… and I love polenta… so when Kathy Hester asked me to take part in the blog tour for her third new book in as many years, I decided to make a version of her Spicy Southern Chickpeas and Grits. Both grits and polenta are made from cornmeal, and I was wrong to think the only difference between these two dishes was the region of origin. You see, polenta, hailing from Italy, is typically made from flint corn, known for holding it’s tecture. It’s Southern counterpart, grits, is typically made from dent corn, which may become creamier. With this in mind, I decided to stick in my comfort zone and adapt this southern classic! With the seasons are changing and weather starts to cool, I know my slow cooker will find a permanent spot on the counter for the coming months. There will be nights of split pea soup, Bombay soup and the hummus soup that I adore. 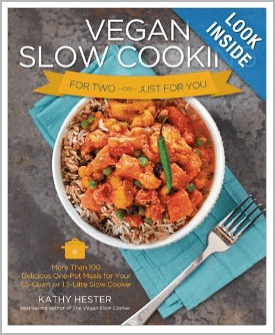 Kathy’s latest title, Vegan Slow Cooking for Two will give me plenty of other ideas that for warm and loving family dinners that I can make ahead. 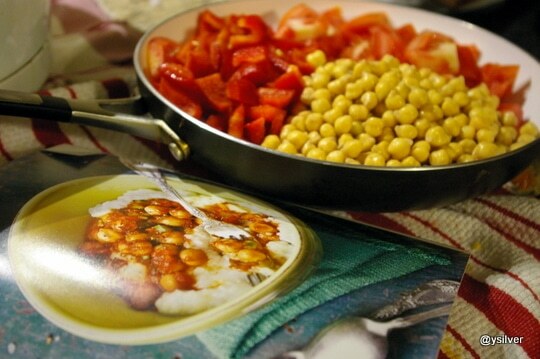 After the recipe, you’ll have the chance to win a copy of this book! I’ll confess that I cheated on grits part and made a creamy, vegan version of my grilled polenta — as I did when I used it for the base of my amuse bouche a couple of months ago, I added a little more liquid, kept whisking and skipped the chilling and grilling steps! This was an evening of delicious vegan Southern Comfort food! Tomatoes, peppers and chickpeas for my cajun slow cooker Southern stew. 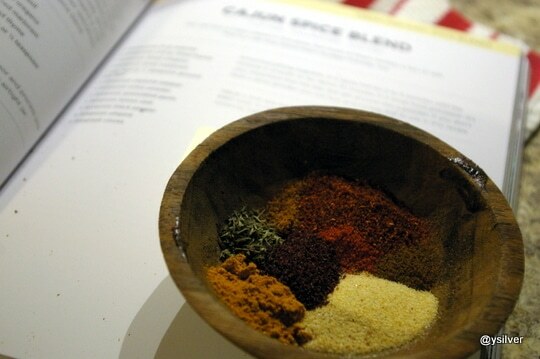 I was a little short on the ingredients for the cajun spice blend, so if you need to adapt this recipe based on your pantry, you will be safe with a combination of paprika, thyme, turmeric, garlic, sumac, nutmeg and cloves. I almost never have allspice in the house and find myself substituting nutmeg, cloves and or cinnamon! Cajun spice blend: Paprika, thyme, oregano, marjoram, ground bay leaf, cayenne pepper, onion powder, garlic, lemon zest, black pepper, all spice and cloves. 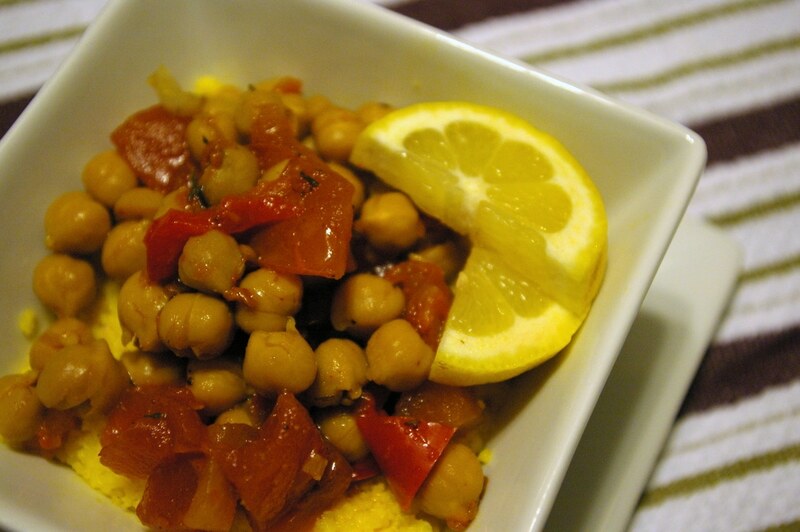 Head on over to Kathy’s website for the original chickpeas and grits recipe. I adapted the recipe slightly and here’s my version. 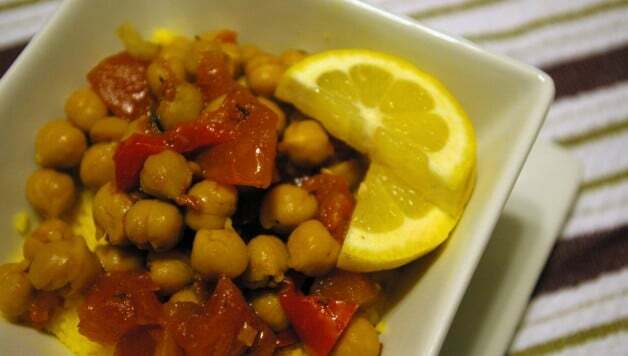 Before serving, taste, add salt and pepper, and then re-season to suit your taste. I added cumin, lemon and a dash or worcestershire sauce. You may need to add more liquid smoke, Cajun seasoning, or chipotle. Serve over Slow Cooker Grits for Two (recipe follows).